Welcome December!! For many, the weekend after Thanksgiving is officially the time when families begin preparing and decorating for Christmas. If you're like me the first item on the list is the Christmas tree. Today I'm sharing ideas to help you achieve that full, showroom look as you decorate your Christmas tree. (Sources for my Christmas tree listed at the bottom). There are several ways to give your Christmas tree that perfect classic look, but before I share my ideas my only rule is to be true to yourself and to be yourself. 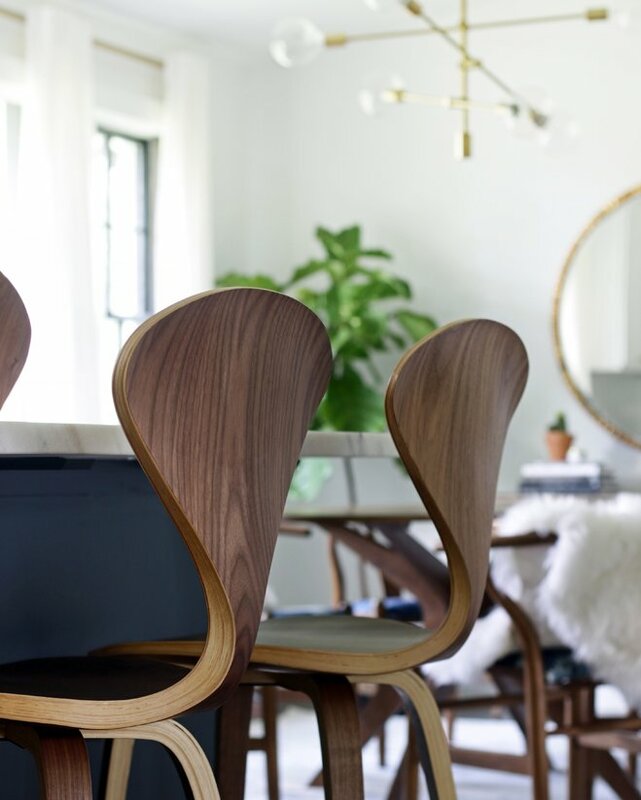 You may want that "department store" look, but remember to make it fit your home and style. Have you ever read the children's book, "Why Christmas Trees Aren't Perfect" by Richard H. Schneider? It's the sweetest story about a perfect little tree named Small Pine. Small Pine lived in a land far away and hoped to maintain its perfect form and be selected by the Queen as her Christmas tree. But as the warm-hearted little tree gave shelter to birds, rabbits, and deer in the forest, its branches became damaged. Fortunately, the Queen had a different idea of perfection! Love what you do. Do what you love. Don't compare. Have fun!! Someone else's idea of perfection may not be your idea of perfection! This year I wanted a more casual look in red and white, with touches of black and silver. I am often asked how to get that full, showroom look. I'm sure that every decorator has their own tips. I tell people, "fillers". Fillers can be anything from garland, ribbon, branches, twigs, picks, fabric, mirrors, faux furs (any fire safe product), that adds volume. Think outside the box and be creative. In my tree this year I've used two pine garlands with berries, two frosted red berry garlands, 6 red berry picks, and 8 flocked picks with cranberries. In addition, I used three different ribbons (1 spool/10 yards of each). Although, I did purchase an extra spool of the red and silver ribbon for other uses. I add the ribbon and fillers first (after the lights, of course). My tree is pre-lit with two sizes of lights: regular mini-lights and large globe lights, which I love! 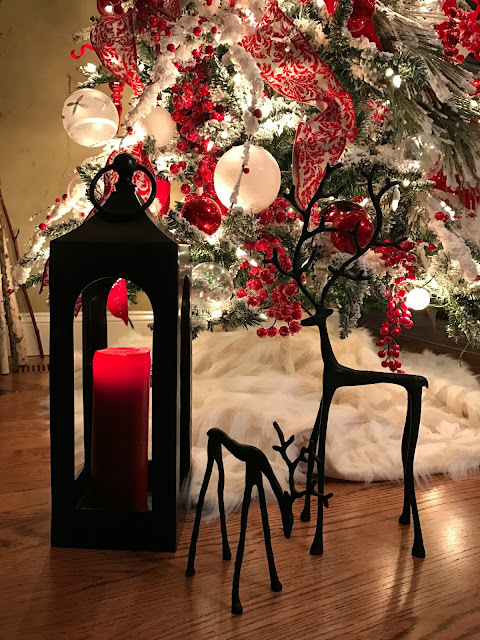 Depending on what you would like to achieve, consider varying sizes, textures, and styles of bulbs, florals, gadgets, stockings, toys, etc., in the colors or theme you've chosen. I like having large bulbs for impact. Subtle or not so subtle, I always like to have what I call statement or impact ornaments. You really only need 2-5 depending on their size. This is one of my family's favorites trees. It's a fun, whimsical tree that reminds everyone of The Grinch! On this tree I only have two bird cages, of course there is a lot of other fun going on all over this tree! In this tree I've incorporated the nativity as the statement of the tree. I've seen people use anything from huge paper flowers to a large sleigh -- think outside of the box. In fact, using cool boxes would be a great idea!! And remember, if your style is simple and country then maybe the the element of simplicity is your impact. Sometimes more is not always better!! I like to sort my bulbs and other decorations, and then working with one group, say all red bulbs, place them evenly over the tree, including a few close to the trunk. I love to see little snippets of color poking through the branches!! Then I place the next group, spacing each type evenly over the tree, trying to achieve a good overall balance of color and spacing. As you're adding your ornaments, think of it as layering. Don't just place your ornaments on the surface of the tree. Place a few deep into the tree and place other more colorful and ornate ornaments towards the ends and tops of the branches. A few tips to remember: Vary the shapes and sizes of your ornaments. Vary the color tones, using shiny ornaments along with matte and textured finishes. 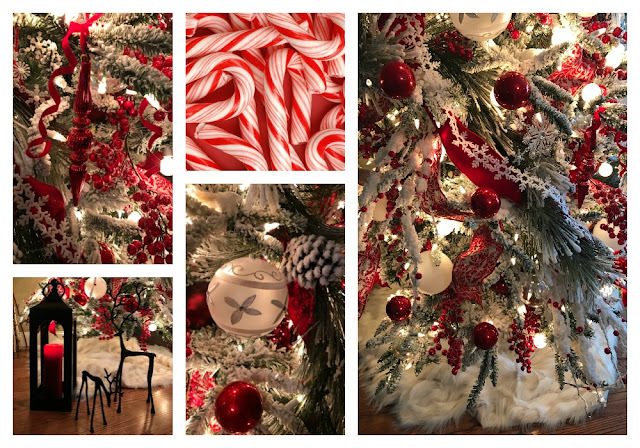 Adding solid color ornaments will help ground the tree and create an element of consistency within your theme. For added impact, try clustering small ball ornaments together with a wire and hang them in groupings. I rarely (okay, never) use wire hooks unless they're decorative. I use a thin gauge wire, loop it through and wire it onto the branch. IT'S EASY!! Just wind it around twice clockwise (always), and when you take them off you quickly unwind them counterclockwise. Easy peasy! Righty-tighty, lefty-loosey. It's fast, secure, and I do this so I can place the bulb either on top of the branch or right up tight underneath the branch. It gives a nice professional look! Another fun look is to string multiple bulbs on the same wire. I usually put either two or three bulbs together, tighten the wire and then wire them to the tree. Fill in with the picks or other items you may have, such as gingerbread men, pine cones, etc. Many of you like to use a traditional angel or star tree topper - I often do, too. But I also like to consider the tree and choose something that goes along with the theme. Let your tree decide what it needs to finish the look. In keeping with my casual feel this year, I left it plain and just used one of the flocked cranberry picks. I usually use a traditional angel on this tree, but instead I made angle wings from fur for something a little different and as a symbolic reminder that while we can't see them, I do believe there are angels watching over us. Unlimited ideas (period)!!! I've seen people use so many different darling ideas from galvanized cans to sleighs to glamorous fabrics and elaborate quilted shirts. And I love them all. Again, choose something that goes with the style and theme of your tree. This year I used this long hair lap throw. It worked perfectly! I hope you find these ideas helpful to inspire your perfect Christmas tree.